U.S. employers added 209,000 jobs in July, and hired more workers in May and June than previously thought, the Bureau of Labor Statistics said Friday. The unemployment rate ticked up to 6.2 percent, but mostly because people rejoined the labor force, a sign of confidence in the job market. The report shows a job market on cruise control, neither losing ground nor accelerating. Whether that’s good news or bad is a matter of perspective. On the one hand, the job market is, by pretty much any measure, the healthiest it’s been since the recession ended five years ago. 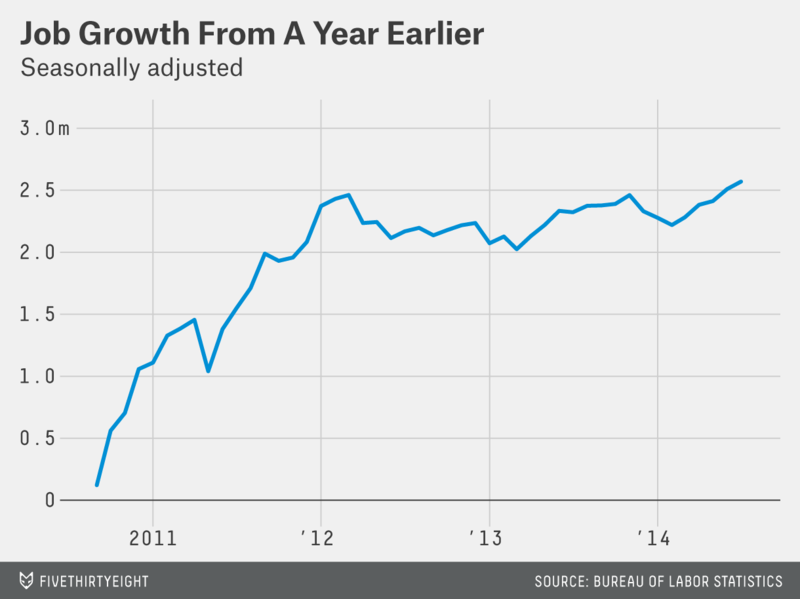 Growth has topped 200,000 jobs for each of the past six months, the first time that’s happened in the recovery. Unemployment, despite July’s modest increase, has been falling steadily, and layoffs recently hit a 14-year low. Hiring has been fairly broad-based in recent months, with sectors that have been strong throughout the recovery, such as health care and energy, remaining so, while long-time laggards such as manufacturing and construction are showing signs of a rebound. Even the government has been adding jobs in recent months. Yet for all that progress, the job market has never found a higher gear. Employers have added about 2.6 million jobs over the past year, a rate of hiring that’s risen slowly if at all over the past two years. That growth hasn’t been enough to generate meaningful wage growth — average hourly earnings were up just a penny in July — or to put the long-term unemployed back to work. The recovery has been resilient — economist Justin Wolfers recently referred to it as the “little engine that could” — but it will take faster growth to close the jobs gap left by the recession. Unemployment’s up, but for a good reason: The unemployment rate rose to 6.2 percent in July from 6.1 percent in June. That uptick is actually within the survey’s margin of error, so the BLS says only that the rate was “little changed.” But even taking the figure at face value, the rise in unemployment was actually a good sign for the economy. The government only counts people as “unemployed” if they’re actively looking for work, so the unemployment rate can rise either because more people lose jobs or because more people start looking for them. In July, the number of job losers fell slightly, but the number of people re-entering the labor force to look for work rose. 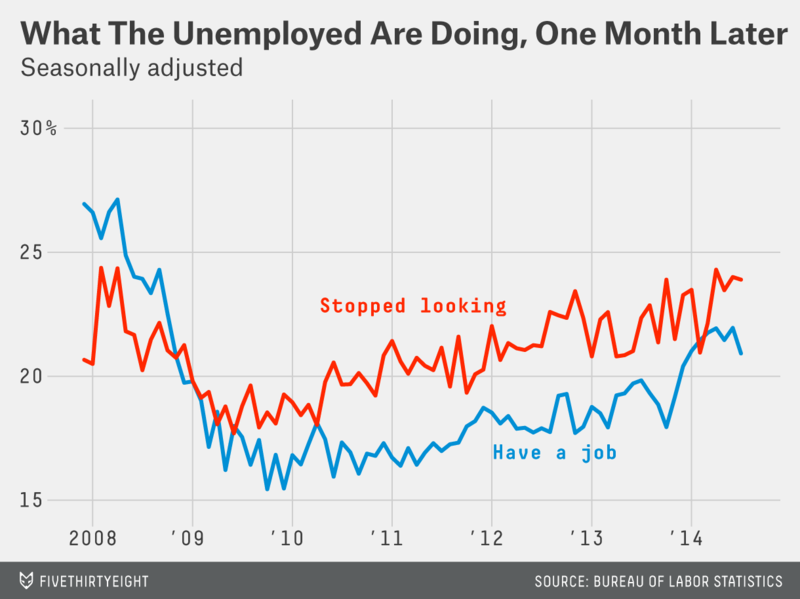 That suggests Americans are becoming more optimistic about their chances of finding work. But it’s still hard out there for the unemployed: For the first time since the recession ended five years ago, fewer than 2 million unemployed workers found jobs in July. That partly reflects the fact that there are fewer unemployed workers period. But the job-finding rate — the share of job seekers getting jobs — also fell slightly, and for the 50th time in 51 months, more unemployed workers stopped looking for work than found jobs. The number of people out of work for more than six months rose slightly, indicating that things remain hard for the long-term unemployed. Good news in revisions: The BLS increased its estimate of May job growth to 229,000 from 224,000, and upped its June estimate to 298,000 from 288,000. The positive revisions are a good sign: The government tends to underestimate job growth during periods of growth and overestimate it during slowdowns. Other forward-looking indicators were more mixed: Employers added fewer temporary workers in July, and for the fourth month running, the length of the average workweek was unchanged. Increasing hours and temporary hiring can be early signs that hiring will pick up in coming months. Wage growth is still muted: Average hourly earnings rose by a penny in July, to $24.15. Over the past year, earnings are up 2 percent. Policymakers at the Federal Reserve are watching wage data closely for hints of inflation; recent indicators have been mixed, with a separate measure of employment costs released this week showing modestly stronger growth. But overall, increases in both wages and prices have remained modest. Prices, as measured by the BLS’s consumer price index, were up 2.1 percent in June from a year earlier; an alternative measure of inflation produced by the Bureau of Economic Analysis on Friday showed prices rising a more modest 1.6 percent. Our monthly reminder: As always, it’s wise to take all the monthly jobs data, and especially month-to-month changes, with a grain of salt. July’s data is preliminary and subject to revision, and the margins of error are large. That doesn’t mean we should ignore the numbers, but it does mean we should be careful about reading too much into the monthly moves.